On August 19, 2017, Shanghai International Restaurant & Catering Show, Shanghai International Catering and Ingredients Exhibition (SHICAI), Shanghai International Frozen and Chilled Food Expo (SIFCE), Shanghai International Condiments and Food Ingredients Exhibition (CFIE) and Shanghai Catering Chain Franchise and Digital Management Exhibition, organized by ITE Asia Exhibitions Limited, Shanghai Gehua Exhibition Planning Co., Ltd. and Shanghai ITE Gehua Exhibition Service Co., Ltd., Shanghai Restaurants Cuisine Association, Shanghai Frozen Food Trade Association and Condiments Committee of Shanghai Food Association, were held in Shanghai New International Expo Center concurrently with World Seafood Shanghai (SIFSE) Exhibition 2017. At 9: 45 a.m, guests and representatives from local governments, provincial and municipal industry associations and consulates of different countries showed up at the scene. Then, Mr. Han Youheng, Executive Director of Shanghai ITE Gehua Exhibition Service Co., Ltd., announced the official opening of the Exhibition. Then, Mr. Gordon, Regional Director of ITE Group, Mr.Tian Quanhai, Chairman of China Aquatic Production Chamber of Commerce, Pu Shaohua, Chairman of Shanghai Fisheries Trade Association, Ms. Jian Heping, Chairman of Shanghai Food Association, Shen Siming, Chairman of Shanghai Restaurants Cuisine Association, and Diego F. Vega Cevallos, Commercial Counselor of Consulate General of the Republic of Ecuador in Shanghai delivered opening addresses one after another and sent best wishes for the success of the Exhibition. In addition, exhibitor representatives including Henan Yongda, Shandong Qihui, Fujian Yaming, Shandong SpringSnow, Xiamen Chenji Leyaoju, Zhengzhou FB Yusheng and Shanghai Lianhao also attended the opening ceremony at the invitation of the Organizers. The Exhibition which covered an area of up to 58,000 square meters takes "A collection of the finest ingredients · leads industry-leading development " as the theme and has attracted more than 1,000 exhibitors. Compared with previous ones, the Exhibition has successfully achieved category refinement and has been further divided into several sections by category: W5 Hall (meat + catering & ingredients), W4 Hall (frozen food + catering & ingredients), W3 Hall (condiment + catering chain + food-related equipment) and W1/W2 Hall (Seafood). 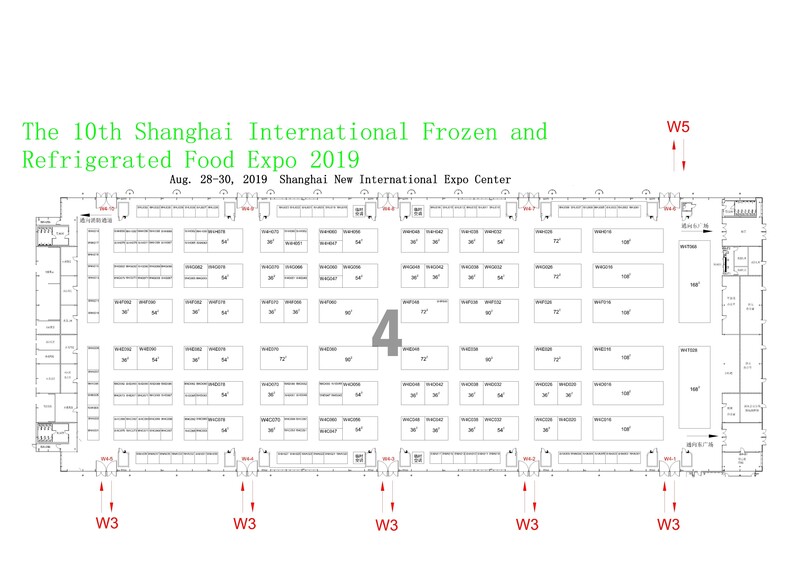 Among these exhibitions, SIFCE and SHICAI are regarded as the two largest annual gatherings of the frozen & chilled food and catering ingredient industries across the country. The Exhibition has covered all kinds of products throughout the food ingredients industry chain and gathered a number of domestic top-class brands including Sanquan Longfeng, Leyaoju, Shanghai Lianhao, Fuzhou Zhengdian, Zhengzhou FB Yusheng, Totole, Yihai Haidilao, Shandong SpringSnow, Foshan Pingroun, Henan Yongda, Weifang Mechain, Jiangsu Hexian Group, Fujian Haixin, Hunan Xincongchu and Guangzhou Jiahao. Meanwhile, a number of foreign specialty cuisines such as Vienna roast chicken, Mexican spice paste, South Korean cheese rice cake, New Zealand steak and Japanese food ingredients have been showcased to elaborately offer a one-stop purchasing platform for purchasers. CFIE is one of the exhibitions that offer the most complete range of exhibits in the industry, covering all kinds of Chinese condiments, Western condiments, food-related ingredients, additives, packaging equipment, etc. With the leap in growth of the condiment market and continuous support from all walks of life, the event has attracted top brands such as Totole, McCormicK, Flavor Full, Dingfeng, and Kewpie for participation, thus fulfilling production-marketing docking, promoting trade upgrading, and stimulating new breakthroughs in the condiment industry from all perspectives. Meanwhile, as one of the catering serial exhibitions, the Shanghai Catering Chain Franchise Digital Management Exhibition has brought together a batch of renowned enterprises including Weizhiwei, Tea & Brown, News Partner, Qiandaodao, Wuxi Liufu, Who's Tea, Oolong Tea, Green Way, Hanbee Matcha, Hangzhou Beverage Investment, Yuzhi Matcha and Nana’s Green Tea. The market-oriented exhibition, advocating high profile, high standard and high efficiency, aims to serve purchasers, strengthen the communication, exchanges and cooperation between enterprises and cross industries, and build a cutting-edge brand promotion platform both at home and abroad for enterprises to develop multi-level markets. In addition, the concurrently-held World Seafood Shanghai has gone through 12 years now since its establishment. As one of the most internationalized exhibition platforms in China, it has received the enterprises from 20 foreign countries including the United States, South Korea, Ecuador, Canada, France, Norway, Vietnam, Iceland, Chile, Pakistan, Spain, Argentina, Thailand, New Zealand, Japan, Russia, Denmark, Holland and Australia. Numerous rare seafood products such as Pacific tuna, Atlantic peony shrimp, Australian lobster, Russian king crab, Antarctic icefish, Arctic sweet shrimp, Australian scallop and West African octopus roll out at the event. Apart from the trade show at the site, the Organisers, along with industry associations, sponsors and leading enterprises, have offered a number of activities and forums. On the afternoon of August 19, the first activity titled "Global Beef & Catering Supply Chain Forum and Tasting Session" was held, where American beef exporters were invited to discuss about the latest American beef policy and disclose the product information and procedures of American beef imports. The second activity was "Cooking Contest of Cold Dishes", a large cooking event organized by the Exhibition in collaboration with the Shanghai Chef Alliance. The activity serves as a platform for learning and exchanges among chefs to improve their competitiveness and the cohesion of enterprises, and help enterprises to look for savory and specialty cuisines, thus driving food innovation and improvement of culinary skills. Meanwhile, in order to better publicize high-quality food ingredients and allow more users to understand and gain access to superior products, the "Excellent Suppliers Selection and Award Ceremony" was held in the afternoon in the Southern Hall of the Shanghai New International Expo Center, intending to propel the food ingredients industry to innovate, strive for excellence and meet the new market demands. On the second of show date, there will be 2 workshops and forums - "Innovative Catering Summit" and "Condiments Technical Forum", where experts, employers and enterprises will deliberate on the latest market trends and join hands for innovative development. As an annual gathering of the catering industry, the Exhibition has been warmly responded, recognized and supported by on-site exhibitors and visitors. It's learned that the number of professional visitors reached 25,038 on the first day, up by 44.2% year-on-year. The Exhibition will undoubtedly bring countless business opportunities for the catering industry growth, investment attraction and economic and trade negotiations. Founded in 1991, ITE Group has 30 offices and more than 1,100 employees across 17 countries. It is one of the leading exhibition organizers in global growing and developmental economic entity. Since 1998, ITE has become a listed company at London Stock Exchange. The Group organizes over 250 exhibitions in 21 countries, covering multiple industries transportation and logistics, construction and interiors, fasteners, food & beverage, oil, natural gas & energy, tourism, safety and protection, fashion, clothing & textiles and automoblies.